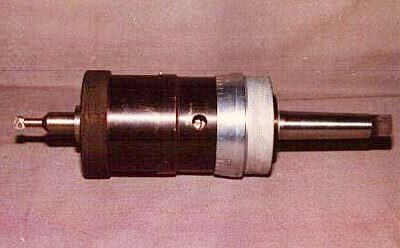 Our Recessing Tool is specially developed for creating recessed groves in existing bore at preset depth. Used for making internal circlip groves, internal recesses or back chamfering on jobs using drilling machines, Machining centers, Boring machines etc. The cycle of working of our Automatic Recessing Tool can be programmed. Besides, we are the most famous Industrial Recessing Tool Supplier in India. The tool consists of a taper shank to suit the machine spindle in which it is mounted. The tool is fitted with a guide bush and tool holder is selected depending upon job dimensions. The smaller collar at the top of the tool can be used to set and control the depth of the groove being cut. The larger collar on the bottom of the tool is used to set the distance of the groove from the reference surfaces. Two methods of guiding the guide bush in the job are adopted. In the first case, wherever possible the guide bush is made to suit an existing bore in the work piece. Whenever this is not possible, a separate jig plate having jig bush is suitably located on the job. The guide bush of the recessing tool takes the guide in the jig bush. The tool is fixed to the machine using the taper provided. The tool is then fed towards the work piece. When the axial surface of the guide bush comes in contact with the reference surface either on the job or on the jig plate, the vertical movement of the tool stops and amount of this movement controls the distance of the groove from the reference surfaces. Further feeding of the tool causes the tool to move out with the help of helical guide and an eccentric cam provided in the tool. This movement is controlled by the gap between the depth adjusting collar and the top surface of the eccentric bush. The gap also controls the depth setting of the tool.